Julie Matulle, a recent graduate of Fox Valley Technical College’s trucking program, is at home behind the wheels of semi. Matulle’s parents owned a small trucking business during her childhood and when she wasn’t in school, she could be found hanging out in the truck. Now 48, Matulle decided to return to the industry after her children were grown. She works for H.O. Wolding Inc. in Amherst and enjoys her frequent routes to the Southeast, which typically begin Sunday morning and run through Friday. “I raised my kids and now it’s my turn to have fun,” Matulle said. Matulle isn’t alone in embracing the trucking industry as a “new” career path. Rob Behnke, instructor and department chair for FVTC’s truck driving program, said the technical college has added space, staff and program offerings to meet the growing enrollment numbers. Demand for drivers with good work ethic who are committed to their employer and the industry will continue for years to come, he said. The American Trucking Associations estimate that more than 100,000 drivers are needed throughout the next three years. Women account for less than 5 percent of students enrolled at FVTC’s truck driving program, but it’s the only career path that interested Matulle. She was awarded the the Mike O’Connell Memorial Award — the nation’s top rookie-of-the-year award — in 2014 and recently participated in Wreaths Across America, delivering wreaths to place on soldiers’ graves in Arlington National Cemetery during the holidays. 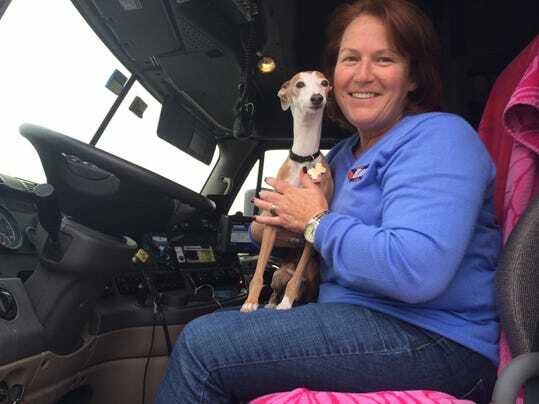 Matulle said she feels “very, very lucky” for the opportunities the trucking industry has provided, and thinks it’s a great profession for men and women alike.